I captured a video of the soldiers upon their retreat from Beit Ommar — when an Israeli soldier deliberately chucked a heavy sound grenade at the feet of a 4 year old boy. The violence erupted when a group of settler youths began throwing stones at Palestinians on the outskirts of the village of Safa. The settlers had left a prayer service held on a nearby hilltop in memory of Shlomo Nativ, 16, who was killed by a axe-wielding Palestinian on Thursday. The settlement is also the origin of a militia called the Bat Ayin Underground. The father of the 7-year-old victim of last week’s attack is Ofer Gamliel, who is serving a 15-year prison sentence for attempting to bomb a Palestinian girls’ school in Jerusalem in 2002. Two other men from the settlement were also jailed for the attempted attack. 15 residents were treated for gas inhalation as Israeli soldiers also attacked the residents instead of removing the settlers who initiated the attack. Local sources reported that the settlers also stole sheep belonging to the residents of Safa. Local mosques in Beit Ummar and Surif called on the residents to aid their brother in Safa, and hundreds of Palestinians rushed to the area. Only then soldiers intervened to stop the settlers and ordered them to return to their illegal outposts. A previously unknown Palestinian militant group calling itself “the Palestine strugglers Army” claimed to have orchestrated the Friday “axe attack” in the Bat Ayin settlement Thursday that saw one teenage settler killed and a young boy injured. In Safa village Israeli troops occupied three homes and declared them military posts. Several bulldozers blocked off entrances to the village, cutting it off totally from its lands and neighboring villages as the Israeli manhunt for the “axe attacker” continues. Safa residents have lived under curfew for 24 hours as troops patrol the streets and raid homes. The residences of Ahmad Ismael Kokas, Ghazi Ahmad Ady, and Isam Ibrahim Ady have been taken over and at least six others suffered damage as troops burst through doors or smashed windows. Villagers say at least 28 have been detained and are being held in an unknown location. Ofer Gamliel, father of Yair Gamliel, who was wounded in the Bat Ayin attack. Ofer Gamliel is currently serving a prison sentence for his involvement in the ‘Bat Ayin underground,’ which had planned to carry out an attack several years ago at a girls’ school in the A-Tor neighborhood in East Jerusalem. The ‘Bat Ayin underground’ was active in the West Bank and East Jerusalem during the early years of the Second Intifada. 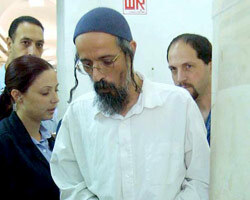 In April 2002, police arrested Shlomo Dvir, Yarden Morag and Ofer Gamliel, ‘Bat Ayin underground’ members, who were later convicted of attempting to place an explosive device near the East Jerusalem school.